Story: Software developers and IT people are a strange lot. Not so long ago they argued that the best way to manage (software) projects was Scrum or some other agile development approach. Some of them were even pretty fanatical about it (and still are). Now they are talking about Kanban. As a veteran in the industry, my friend and colleague project manager, David, has already enough trouble bridging the gap between these agile development teams and the rest of the organization that is not so agile (for good or for bad reasons). He is not sure whether to follow this Kanban thing or not. 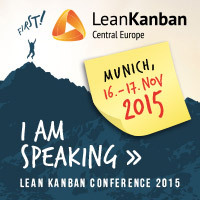 Is Kanban just the next fad? The new new thing? Is it limited to IT/software projects? Or is there something more to it? In this and subsequent blogs, we describe a number of patterns for managing projects with Kanban. These patterns have been discovered in real life application of Kanban in project organizations (both IT projects and non-IT projects). The patterns we describe here can be understood and put into practice independently but their full potential is only realized when they are used together. Taken together they are a crucial component of what we call lean adaptive management. The patterns explicitly show how project management can be adapted to the realities of dealing with the complexities of projects in the real world (as opposed to the idealized world in which all projects succeed). These complexities include shifting priorities, multi-tasking, communication problems, and resistance to change. Story: Now things are much clearer. After studying the patterns of actual use of Kanban in project organizations, David understands how Kanban actually helps to address project management challenges: identifying and managing resource bottlenecks, identifying and overcoming communication bottlenecks, identifying and overcoming people bottlenecks. Maybe Kanban and project management make a good marriage?